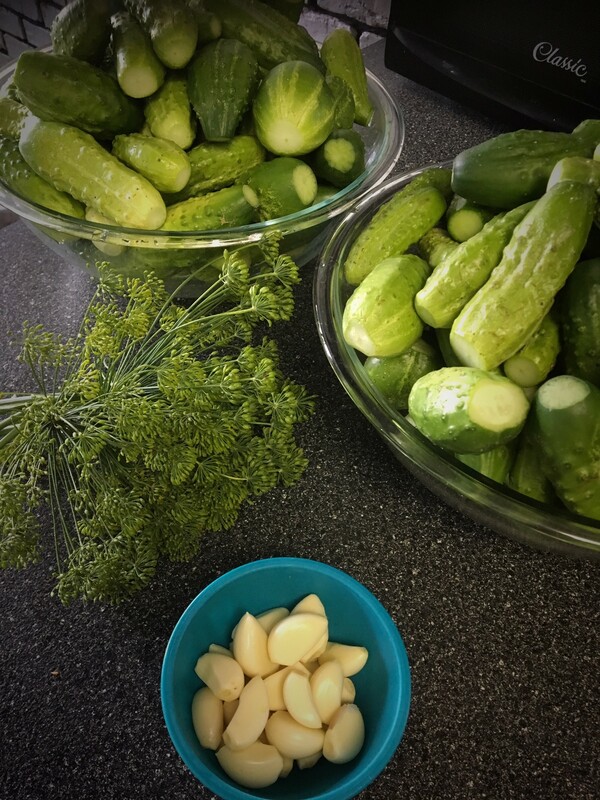 It has been many years since I made nice garlicy dill pickles. I am usually drawn to making Yum Yums as they are a taste of my childhood and instantly take me back to my baba’s dining room table and the many family gatherings we would have. But this year I am craving dill pickles, vinegary and heavy on the garlic! After a very wet hot summer this years cucumber bumper crop did not disappoint. With a huge amount of cucumbers I have more then enough to do at least a double batch of dills. I don’t like any funky spices in my dill pickles and keep it very simple with fresh dill and garlic. To give it a bit of extra zip I use a 7% vinegar. As always be sure to sterilize all your jars and have them hot and ready to fill. Warm all lids and screw bands in a small saucepan keeping warm until needed. All pickles are processed in a hot water bath, be sure to check on times for your specific elevation. And to keep things clean and efficient I always use my canning funnel to aid in the addition of any liquids which I am using during canning. Scrub the cucumbers with a brush making sure all dirt is removed. Trim a bit off of each end of the cucumbers. Peel cloves of garlic, I used 4 cloves per jar. Shake the dill heads well to remove any bugs, give a quick rinse under water and place on paper towels to dry. In a large pot combine the vinegar, water and salt. Bring to a boil and boil for 3 -5 minutes. Place a head of dill and 2 cloves of garlic into the jars then fill with cucumbers packing tight. Add two final cloves of garlic. 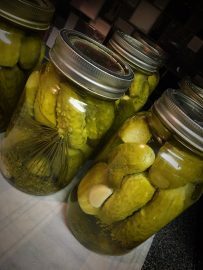 Using a canning funnel fill each jar with hot pickling brine. Allow the jars to cool for 24 hours on the counter before moving. Make sure all jars have sealed by pushing down on the center of the lids. If there is any type of flex the jar is not sealed and should be stored in the fridge and consumed first. A properly sealed lid has no give and will be slightly concaved. Store pickles in a dark cool location. The are ready to be enjoyed about 2 weeks after canning and will last up to one year in storage. Hi Melissa, I completely agree, there can never be too much garlic. No one really made dills in my family but I did get a love for making pickles from my Baba, she made the most amazing Yum Yums which are my absolute favourite. I have had the dills with the funky spices, I did not enjoy them at all. Dill & garlic is all one needs for a true Dill pickle. You absolutely could come steal a jar! 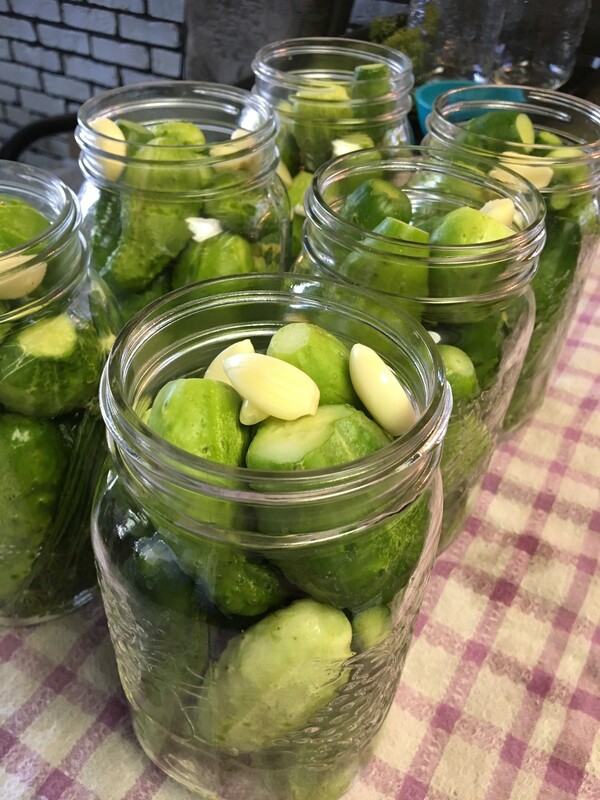 You should give pickling a try sometime, it is actually pretty easy and so satisfying! I love pickles and the more garlic, the better! Can I just come steal a jar? I’m reluctant to make my own – death by botulism, anyone? I haven’t made dill pickles for years, but this has inspired me to make them again. Love your simple, easy recipe with no “funky” spices! I LOVE pickles but have yet to make them. Gotta give them a try! Pickles are the one things I simply cannot live without. Dill being the top favourite. The more garlic and salt the better! My Aunt made the best pickles and I would often sneak a few from the table before Christmas dinner.